Lily is dead. But a mysterious letter launches her half-sister, Jessa Palmer, on a harrowing journey into the wilds of Cornwall to rescue Lily’s daughter from a tyrant of a father, a man who confessed to murder. 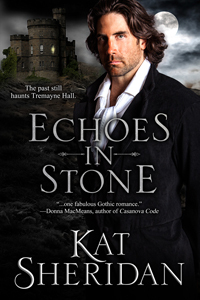 Jessa follows in Lily’s footsteps to a forbidding castle on the cliffs, but discovers the past will not stay dead at Tremayne Hall. Someone—or something—wants to ensure Jessa is no more successful at escaping than was Lily. Bitter, brooding, and tragically scarred, Viscount Dashiell Tremayne believes Jessa is just like her manipulative, unfaithful half-sister. He’s not about to let another treacherous woman into his home or into his heart. Particularly not a woman who’s come to steal his daughter. Only one can win in the battle for a child’s life. Then the accidents begin. Jessa wants only to take her niece and escape the grim manor. But Dash, fiercely protective of those he loves, gives up nothing that belongs to him. As the danger escalates, so does the heat between Jessa and Dash. Soon she’ll have to make a choice: surrender the child to a man she cannot trust or surrender her heart to the same fires of passion that destroyed Lily. Jessa recoiled, gasping, unable to tell if her racing heart owed more to the sizzle in the air or the figure illuminated in the flash of light. They stood in a frozen tableau, staring at one another. Towering over her, the monstrous man looked large enough to manage any unwary hound of hell that crossed his path. A wild mane of unkempt ebony hair fell to his shoulders, leaving his face half in shadow. Powerful-looking thighs strained the seams of his black trousers. His knee-high boots, spattered with mud, molded muscular calves. In that single flash of lightning, his black silk shirt, open to the waist, had revealed a fine mat of coal black hair curled against bronze skin. Nothing disguised the breadth of chest and shoulders. With the shouted words still echoing around the half-lit room behind him, he seized Jessa’s wrist and yanked her into his arms. Jessa jolted as if licked by a tongue of lightning. A frisson of electricity sizzled from the rough hand clutching her wrist, hissing through her body, engulfing her senses. Her heart pounded as loudly as the thunder that continued to rumble overhead. Heat, radiating from his body against hers, poured over her in waves. Shock immobilized her. Words strangled in her throat. What little breath she was able to draw into her lungs came in ragged gasps and coherent thought was beyond her capabilities. The nightmarish creature held Jessa in a bruising grip. He vibrated with fury; the tension of it jangled her nerves. Pent up worry and exhaustion from the journey already had her head throbbing. Now terror sluiced through her veins. Surely, the master of the house had lost his mind, to allow this madman to answer his door. He unclenched a white-knuckled fist, raising his hand. The beast! He did not strike, but moved his hand to the curtain of ebony hair shadowing his face. He raked his fingers through it, pushing it back to reveal what had been hidden. His eyes bored into hers, daring her to look at him. For a single beat of time, all sound—all motion—stopped. A wave of horror mixed with the fury already swamping her; the toxic brew caused black spots to swim before her eyes. Renewing her struggles to pull her wrist from his iron grip, she managed only a single step back from the brute, her free hand raised to stifle another cry. She turned away, but it was already too late to erase the vision. The right side of the man’s face was a thing of dangerous beauty. Even in the meager light provided by the sconces in the entryway, his aquiline nose looked as if it were carved from the same granite as the craggy tors that crowded around the mansion. Beneath hooded lids, his polished pewter eyes glittered with an unholy light. A stubble of black and silver beard covered his cheeks and barely visible cleft chin. The left side of his face, however, was an apparition from a night terror. Slashing through his eyebrow, then curving in a long crescent the length of his cheek to the corner of his mouth, a jagged scar disfigured the rugged face. It lifted the corner of his mouth, lending it a sardonic smirk even now, when there was unmistakably no humor in his shadowed eyes. His mocking tone flayed her nerves; he may as well have laid a whip to her skin. The brutal, whiskey-scented words washed over Jessa, mingling with the scent of leather and some other aroma. The combination set up a peculiar thrumming in her blood. “Speak to me!” His voice was as dark as the rest of him; his roar rivaled the thunder echoing off the peaks surrounding this gloomy hall. Jessa could do no more than stare at him. Lily? This hideous creature thinks I’m Lily? She opened her mouth to rebuke him, but he forestalled her by running his callused thumb over her lips. A tremor shook through her. She snapped her mouth closed, clenching her jaw. Should have bitten the beast. Then again, who knew what kind of poison was in his blood? The whispered words snaked across Jessa’s overwrought nerves, grating on them more than his shouting. “Let me see,” he said. “Let me see if that treacherous tongue still lies within that exquisite mouth.” He yanked her closer, pinning her against his chest with one muscular arm, trapping her hand between them. In a motion too sudden to allow for protest, he first shoved back her veil, knocking her enveloping bonnet half askew. Then he brazenly sleeked his hand down her body, grazing her breast, then squeezed her bottom through the wet gray wool. He lowered his head, his intention clear. Stung into action, Jessa shoved against his chest, struggling against him. “I said unhand me, you beast! Let me go!” She raised her free hand, fingers curled to claw his face. He easily caught her wrist, his grasp threatening to shatter it. Held tight as she was, she could gain little leverage. His unyielding chest was hot and slick under her icy hand. Whorls of hair rasped crisp against her palm. She snapped her head back, turning away to avoid his kiss. “Why will you not stay where I put you?” His breath hissed in her ear. “Go back to hell, Lily! Go to hell and leave me alone here in mine!” With his shouted words ringing, he thrust Jessa away as suddenly as he’d snatched her to him.